It’s the most wonderful time of the year. No, I’m not talking about the holidays, I’m talking about the yearly ritual that us film lovers and movie geeks get to indulge in which requires taking a trip to watch the highly coveted series of Oscar Nominated Shorts at the local cinema. Oh I how I look forward to this annual treat where I go with my fellow Moviewallas and get to spend a delightful afternoon watching ten of the best shorts Animation and Live action Features; two separate programs with a short break in between. This year a special pleasure for me, I got to watch five incredible documentaries too. This collection of shorts representing filmmaking in 2013 is no different to any other year in that the Oscar nominated shorts is an opportunity to watch bite size nuggets of incredible film making from a variety of talented filmmakers from around the world. Only I am shocked that year upon year the standard gets better and better. “Aquel No Era Yo (That Wasn’t Me)” (Director: Esteban Crespo, Spain/Spanish). Synopsis: Paula, a Spanish aid worker, has an encounter with an African child soldier named Kaney. “Avant Que De Tout Perdre (Just before Losing Everything)” (Directors: Xavier Legrand and Alexandre Gavras, France/French). Synopsis: Miriam has left her abusive husband and taken refuge with her children in the local supermarket where she works. “Helium” (Directors Anders Walter and Kim Magnusson, Denmark/Danish). Synopsis: A dying boy finds comfort in the tales of a magical land called HELIUM, told to him by the hospital janitor. “Pitääkö Mun Kaikki Hoitaa? (Do I Have to Take Care of Everything? )” (Directors: Selma Vilhunen and Kirsikka Saari, Finland/Finnish). Synopsis: Sini tries frantically to get her family ready to leave for a wedding, but her husband and two children are interfering with her efforts. “The Voorman Problem” (Directors: Mark Gill and Baldwin Li, UK/English). Synopsis: A psychiatrist is called to a prison to examine an inmate named Voorman, who is convinced he is a god. I could have spent way more time with any one of these five movies given the deep well rounded characters and back stories each presented that merit full movies of their own. “Feral” (Directors Daniel Sousa and Dan Golden, USA/Non-dialogue). Synopsis: A wild boy who has grown up in the woods is found by a hunter and returned to civilization. “Get a Horse!” (Directors: Lauren MacMullan and Dorothy McKim, USA/English). Synopsis: Mickey Mouse and his friends are enjoying a wagon ride until Peg-Leg Pete shows up with plans to ruin their day. “Mr. Hublot” (Directors: Laurent Witz and Alexandre Espigares, Luxembourg/France/Non-dialogue). 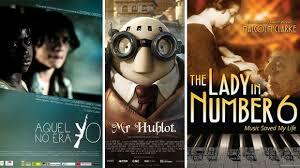 Synopsis: The eccentric, isolated Mr. Hublot finds his carefully ordered world disrupted by the arrival of Robot Pet. 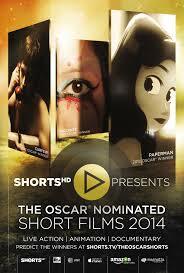 The animation shorts for me represent a vast array of style, story and genre even. Whilst watching we are reminded by those super smart and talented people at Disney that there is always room in your heart to let in a fresh Mickey Mouse Adventure. In Get a Horse, Mickey and his pals return in this old/new caper. This time however our eyes get to feast on incredible technology that combines black and white with color and 2D with 3D type animation. Room on a Broom is a sweet modern day fable told in verse that had me smiling from ear to ear; a special treat for animal lovers. Atypical subject matter for a traditional cartoon, in Feral and Possessions which to me represent more adult type themes and style and finally a cute futuristic tale called Mr Hublot which at it’s core is represents a beautiful tale of a man who rescues a dog but realizes in the end that it is he who has been rescued. Again, a wonderful gaggle of talent collected under the umbrella of animation and if you weren’t lucky enough to catch The Blue Umbrella when it played as an appetizer to last year’s Disney/Pixar’s Monster’s University, it plays in the “highly commended section” in this program. Despite the number of times I see The Blue Umbrella, I can’t help but marvel at the human like emotion that is generously created by Pixar and I always have a lump in my throat when the credits run. “The Lady in Number 6: Music Saved My Life” (Directors: Malcolm Clarke and Nicholas Reed, Canada/USA/UK – English). Synopsis: At 109, Alice Herz Sommer is the world’s oldest pianist…and its oldest Holocaust survivor. At the heart of her remarkable story of courage and endurance is her passion for music. “Karama Has No Walls” (Director: Sara Ishaq, UAE/UK/Yemen – Arabic). Synopsis: When protesters in Yemen added their voices to those of other nations during the Arab Spring, the government responded with an attack that left 53 people dead and inspired widespread sympathy throughout the country. “Facing Fear” (Director: Jason Cohen, USA/English). Synopsis: As a gay 13-year-old, Matthew Boger endured a savage beating at the hands of a group of neo-Nazis. Twenty-five years later, he meets one of them again by chance. “Cavedigger” (Director Jeffrey Karoff, USA/English). Synopsis: New Mexico environmental sculptor Ra Paulette carves elaborately designed and painstakingly executed sandstone caves, driven by an artistic vision that often brings him into conflict with his patrons. “Prison Terminal: The Last Days of Private Jack Hall” (Director: Edgar Barens, USA/English). Synopsis: In a maximum security prison, the terminally ill Jack Hall faces his final days with the assistance of hospice care provided by workers drawn from the prison population. In San Diego, the Live Action and Animated programs will open at the Landmark Ken, In Los Angeles the Live Action and Animated programs will open at The Nuart in West L.A. and in Orange County at the Regency South Coast Village 3.